So I interviewed people who in some sense had exited sistema, distanced themselves or had time for reflection (I describe this ‘slow cooking’ methodology in a recent SSEES working paper. Distance from sistema enhanced their ability to articulate – as happened with understanding of the Soviet system after its collapse – and provided a useful point of comparison (especially if people had a chance to live elsewhere). The main point of conceptualising sistema, even if in this elusive way – as governance within governance – is that it has comparative potential. One could indeed compare the inner workings of Chirac’s, Berlusconi’s and Putin’s power networks, whose continuities and changes are determined by short-term, long-term and universal factors of informal power (as well as personalities). Yet it is also possible to compare anonymous and historically rooted governance models that seem to be reproducing and ‘framing’ the workings of power networks and their trickle-down effect, regardless of who is in power. I argue for the de-personalisation of sistema. Personalities are important in a short term, but in the long-term every leader is a hostage of sistema and sistema will dispose of him when he stops being the right person for its reproduction. Putin has been successful in reinventing himself, but looking to future analysis – if undertaken by researchers of sistemas in other societies – it would make sense to ‘look the other way’ and explore non-sistema forces. And not just non-sistema opposition or protest movements – which are fairly well-researched – but their also their spectrum and potential. On the basis of various election results about 62% of Putin’s supporters are likely to have a vested interest and benefit from sistema. What are the remaining 38% up to and how far do the diffuse and trickle-downs effect of sistema go? Does sistema filter out unsuccessful, non-career oriented people who don’t mind having a low profile and businesses which are not big enough to catch an eye of a raider? Do the non-sistema forces grow from the ‘blue buckets’ motorists’ movement and gay rights supporters? Or sections of the internet and blogosphere, who do not necessarily qualify as civic activists, but seem nevertheless to be targeted by sistema? Sistema is sensitive to any threat to its reproduction, so the recent measures aimed at the foreign assets and bank accounts of state officials can be interpreted as necessary to rein in officials who develop financial independence and a certain ambivalence, if not sense of inner protest, towards sistema. Sistema survival depends on control of non-sistema forces. Yet the most important threat to it is economic. It is expressed in Russia’s petro-paradox: only such a rich country can afford to have a system of governance as inefficient as sistema. There are also threats like weakness vis-à-vis globalisation, especially in the legal sphere, where Russia is losing its sovereignty and control over its assets. I have to admit that research into sistema undermined my earlier belief that unwritten rules can be identified. They can be conceptualised, in theory, as the so-called meta-rules, or rules of breaking the rules. Yet empirically, I have to admit they would be possible to pin down as a coherent set of rules. For example, it is impossible to determine whether the law was used in good faith or manipulated according to an unwritten rule whereby the letter of law is followed only to violate its spirit. So, we have to think about the functional ambivalence. I do stand by my conclusion that to overcome the grip of unwritten rules it is ‘simply not enough to transform the formal rules and the way they are enforced’. This view informs my take on modernisation. According to modernisation agenda of then President Medvedev Russia’s modernisation priorities were: institutions, infrastructure, innovation, investment and intellect. My addition to this list would be informality. The main point is simple: to modernise what works (informal networks), as well as what doesn’t (formal institutions). So far issues associated with informal governance have not been on Russia’s modernisation agenda or part of administrative reforms. In my view, modernisation of the use of social networks might be central to the overcoming of the so-called ‘modernisation trap of informality,’ currently known as ‘manual control’ or micromanagement. I have argued that blat under communism had a more equalising effect on society that power networks have today. It was not egalitarian, but it gave an additional channel – sociability – for outsiders to access resources, formally allocated to nomenklatura. The trickle-down effect of the present-day ‘economy of kickbacks’ seems to be the reverse: it undermines competition, excludes outsiders and rewards insiders through network-based allocation and mobilisation. I contrast the implications of the functionality of grassroots and power networks, even if they share similar features and ambivalence. If blat networks tended to operate on the basis of informal obligation seen as ‘help’ or ‘mutual aid,’ power networks tend to operate on the basis of a formal, hierarchical, patron–client logic associated with practices of ‘feeding’ (kormlenie) aimed at enhancing the power of the patron or his/her network. Patron-client networks are known everywhere for their parasitism on state resources and abuse of administrative power. Yet in Russia they are perceived as more stifling for business than in China, which has been a taboo in contemporary anti-corruption studies. Chinese networks are better monitored – there is a system of checks and balances, hotlines and letters that are taken seriously by the Communist party – and can be managed internally with more awareness of guanxi. Chinese also regions enjoy much more independence that Russian regions, which also has implies local growth, rather than centralisation of resources. Cultural differences are also important: a sense of measure is a key Confucian value that can be contrasted to Russia’s spiritual aversion to moderation. Whether networks are more important under communism or post-communism is difficult to analyse due to the immeasurability of such a complex phenomenon. Three caveats are essential for tackling this question. Firstly, one has to assess just how dependent people are on their networks for everyday consumption and which of their needs are satisfied through the use of contacts. The more basic those needs are the more people are dependent on social networks. The more advanced needs are the less dependent people will be on social networks, but their use is likely to be much more divisive (it produces more inequality). Secondly, the advantages received via networks in societies with private property are likely to be more significant in volume than in those where state property predominates. The blurred boundaries between the public and the private seem to enhance the use of networks for crossing them). Thirdly, it is important to note the functional ambivalence of networks: they can both support and subvert formal institutions and informal norms, making it still more difficult to assess their impact. Generally, the use of social networks mirrors the nature of formal and informal constraints of political and economic regimes, but the idea of harnessing the potential of social networks to change institutions is difficult to implement due to the ambivalence of networks and ethical controversies, similar to those surrounding ‘nudge’ policies in the UK and elsewhere. What it lacks in democratic virtues, the sistema appears to compensate for with the effectiveness of its informal incentives, control and capital flows operated by power networks and their impressive mobilisation capacity. Reliance on networks enables leaders to mobilise and to control, but also lock politicians, bureaucrats and businessmen into informal deals, mediated interests and personalised loyalties. This is the ‘modernisation trap of informality’: you cannot use the potential of informal networks without triggering their negative long-term consequences for institutional development. Am I more sceptical about Russia’s prospects that I was in 2006? I would say that my position has not changed. Then and now, I believe in Russia’s paradox, ambivalence and unpredictability. On a personal level, I adhere to Gramsci’s formula: pessimism of intellect, but optimism of will. I note very promising changes that have taken place in large cities, but I also want to speed things up in remote areas. I believe that reflective leadership can make a difference – including difference in leadership style. Putin has reinvented himself (but not his networks) many times. Back in 2005 he was not ready to engage in an anti-corruption campaign. Instead he pointed out many times that Russian democracy was only 20 years old and it should be given time for economic growth and development. His attitude to corruption has changed by 2006. Then he envisaged that the next president would tackle it – and Medvedev did indeed has initiate very important anti-corruption legislation. Putin 3.0 has taken the anti-corruption campaign to a new level, announcing measures against foreign assets and offshore businesses. It might be wishful thinking, but there is a clear ‘behavioural’ turn in public policy thinking towards the disaggregation of formal, normative agendas and a focus on informal, ‘what-works’ governance tools. 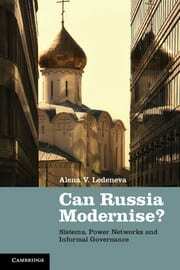 Alena Ledeneva is Professor of Russian Politics and Society at UCL-SSEES.